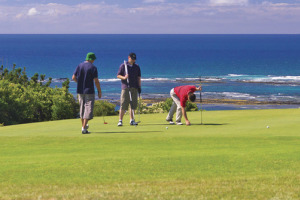 Our aim at Coastal Golf Victoria is to make organising a golf getaway as easy as possible for you, to ensure a memorable and care free experience for you and your group. To get started, all you need to do is tell us your approx group size, choice of courses to play, the type of accommodation you prefer, when you are looking to travel and anything else you want us to incorporate into your package, and we will come up with a few options for you to choose from. Our local knowledge and experience ensures that the packages we recommend are perfectly suited to your groups requirements. We can even come up with a few suggestions and ideas to make your getaway even more memorable. Flights - Are you traveling from interstate? We work very closely with a qualified travel agent with over 20 years experience in the travel industry who can take care of all flight and travel insurance requirements. Meals, dinner bookings, prizes, BBQ packs, on course competitions, private post golf presentation areas, group golf lessons - all details which we can take care of for you. The Bellarine Peninsula is full of great little towns to explore, and there is plenty to do for everyone. See below for some 'away from the course' activities we can arrange for you to make the most of your time on the Bellarine. X Golf - located at Lonsdale Golf Club or Geelong central. Golf & dining packages available.